Mandukhai (Manda) Bataa lives in Khovd, Mongolia, a town with a population of less than 30,000 where over half the population still lives out the -40° F winters in gers, the traditional Mongolian felt tent. Manda’s inquisitive, brilliant mind has opened several doors for her to further her impact not only on her own community, but on Mongolia, and even the world at large. Her local and international experiences have led her to appreciate the value of public policy in building peace within and between nations and have inspired her to work towards securing certain cornerstones for peace – environmental sustainability, in particular. Currently a junior at the Institute of Finance and Economics, Manda has been conducting academic research on “green accounting,” developing metrics by which mining companies in Mongolia can measure any negative impact their operations may have on the environment. 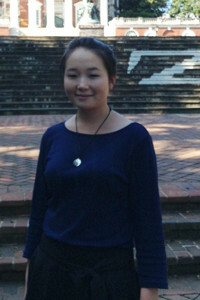 In 2013, Manda was granted a scholarship to study public policy at the U.S. State Department’s Study of U.S. Institutes (SUSI) program at George Washington University in Washington, D.C., along with students from Libya and Kazakhstan. In 2010, she was chosen for a competitive internship at the Khovd Health Department, where her excellent translation skills were enlisted to translate documents and discussions between Khovd’s highest elected officials and the American staff there. She also provided valuable insight into the Khovd youth culture, enabling the Health Department to design more effective youth oriented programs. Manda also won a spot in Access, a highly selective micro scholarship program offered by the Peace Corps for promising students from low income families.